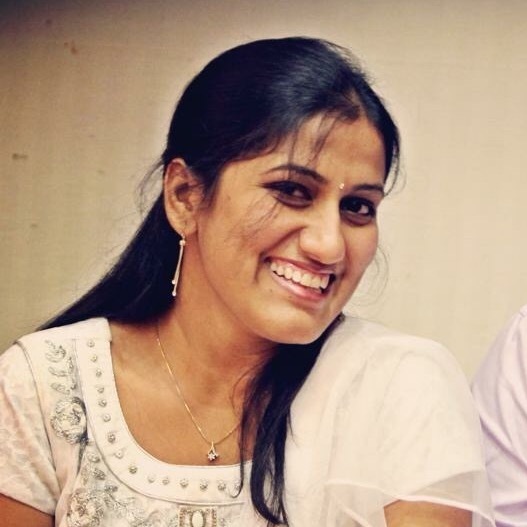 My first post in 2015! 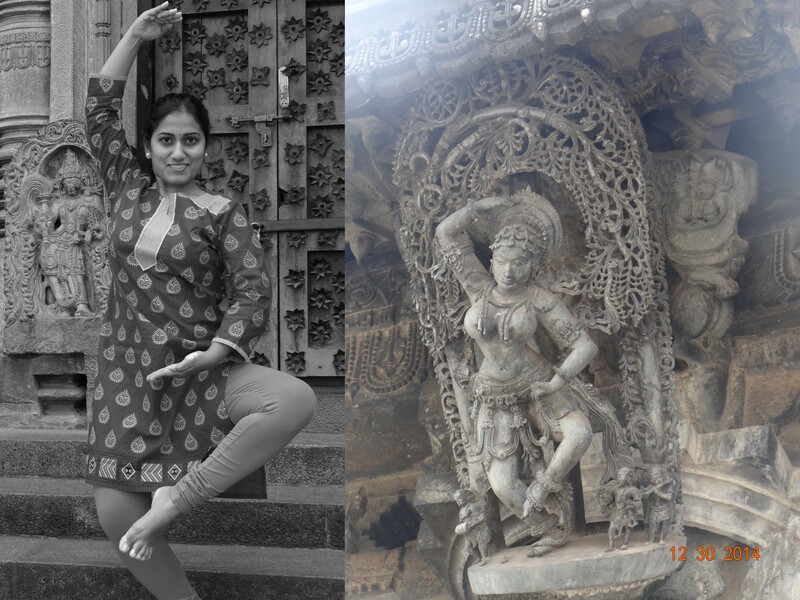 My new year started off with good amount of travelling as I visited India for Christmas vacation. 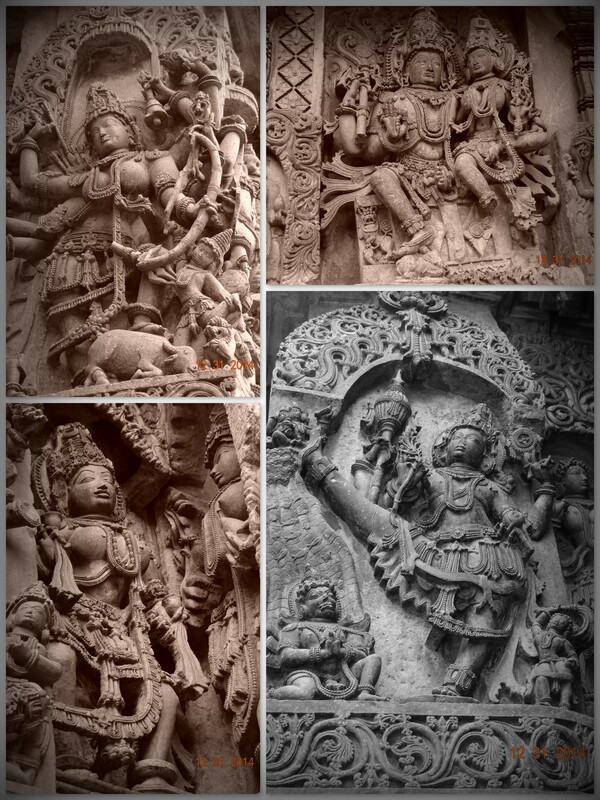 My husband and I had an unexpected tryst with the glorious past at Belur and Halebidu, Hasan district, Karnataka India, two amazing architectural prodigies of medieval India. This weekend gateway is worth the time and experience! Here we are, sharing our experience! This post is even more special for my husband and I, together worked on this post! 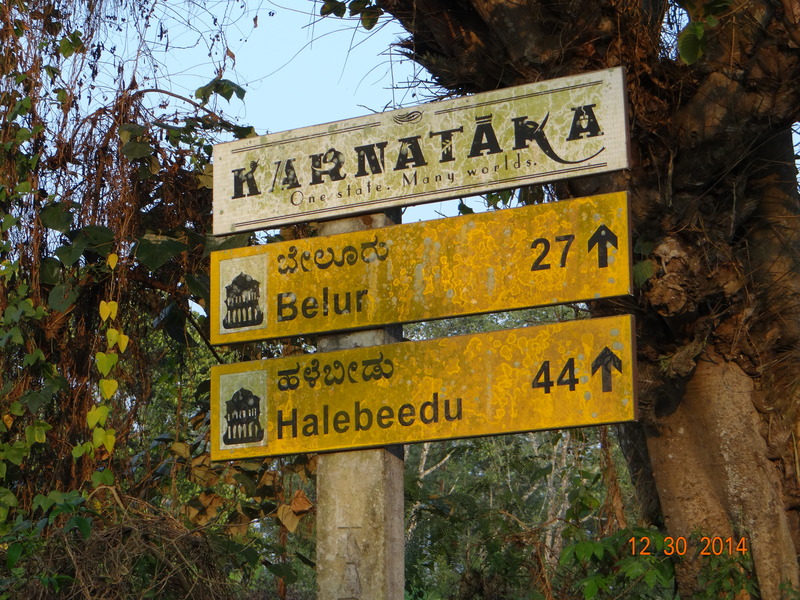 Accommodation:We stayed at Hoysala Village Resort, which is about 12 km away from Belur Halebidu (22 kms), Belavadi and Chikkamagalur (~35 kms). 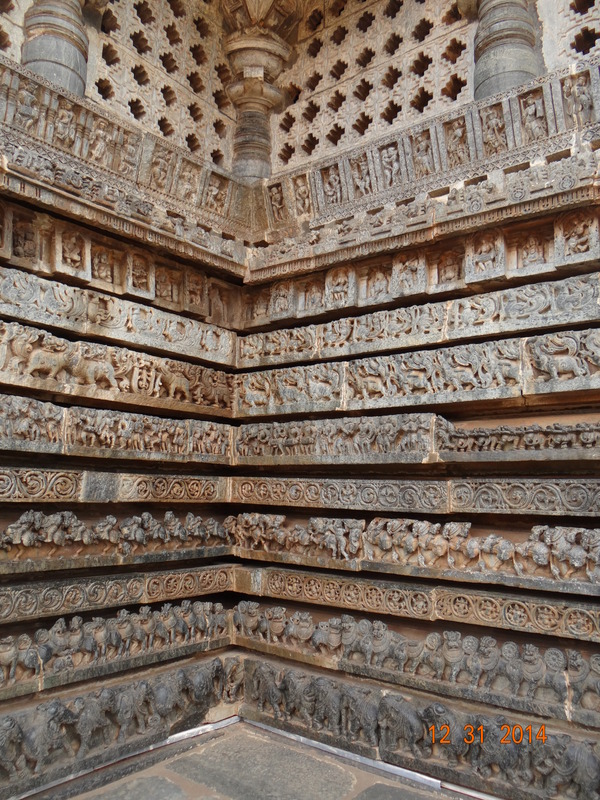 It is also near to many other tourist attractions including Halebidu. This place too was a surprising random discovery. 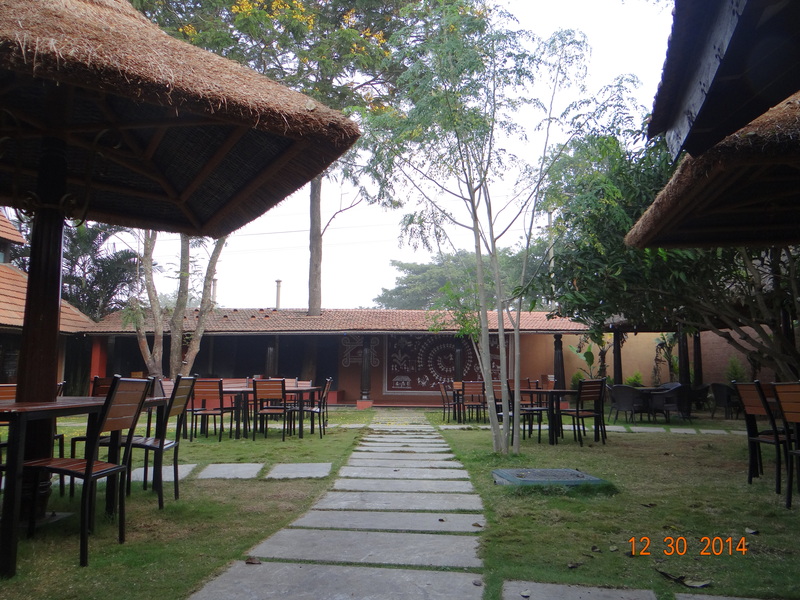 The resort has pleasant atmosphere, beautiful rooms, great hospitality, delicious, authentic Karnataka food and soothing live music. We stayed there overnight. 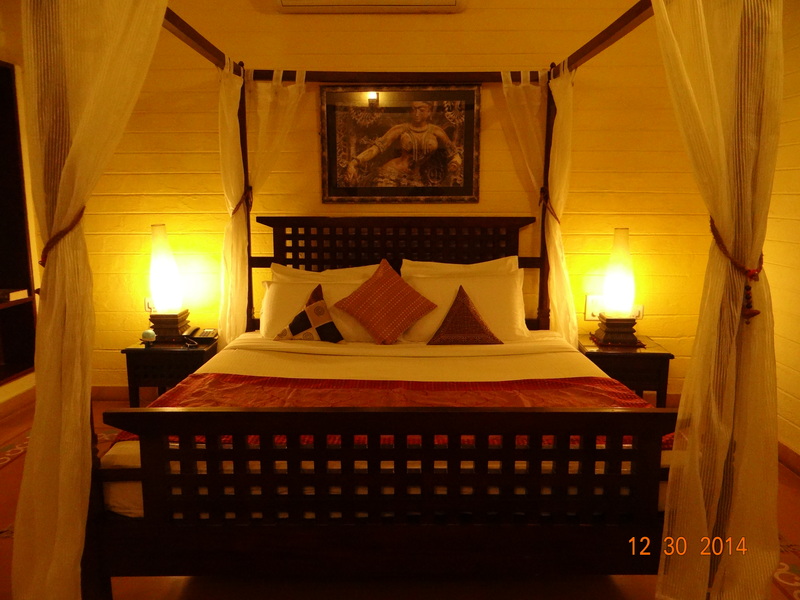 The accommodation comes with breakfast and dinner and with good deals. 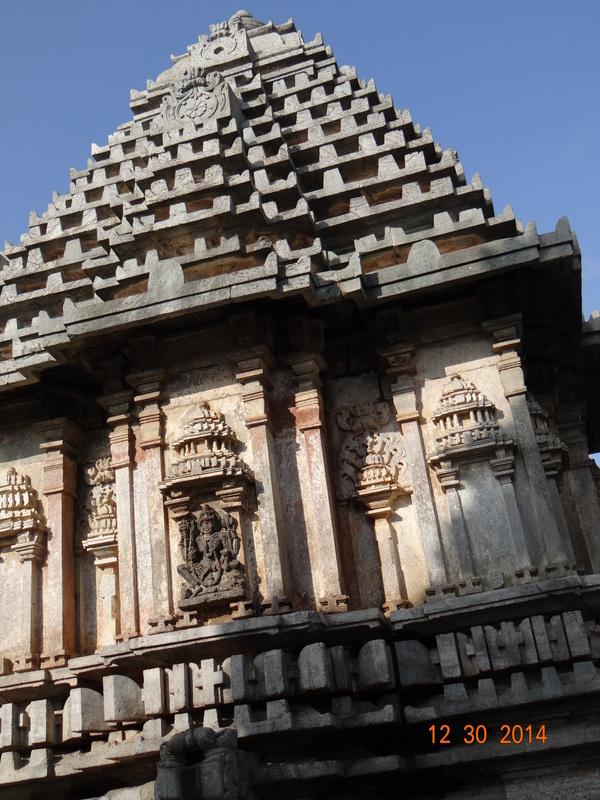 So we highly recommend it, when you plan to visit Belur and Halebidu. Best time to visit: Anytime other than summer, as you would need to walk quite a bit. When you visit historical places, it is always great to have a tour guide, who can make your experience even more worth. 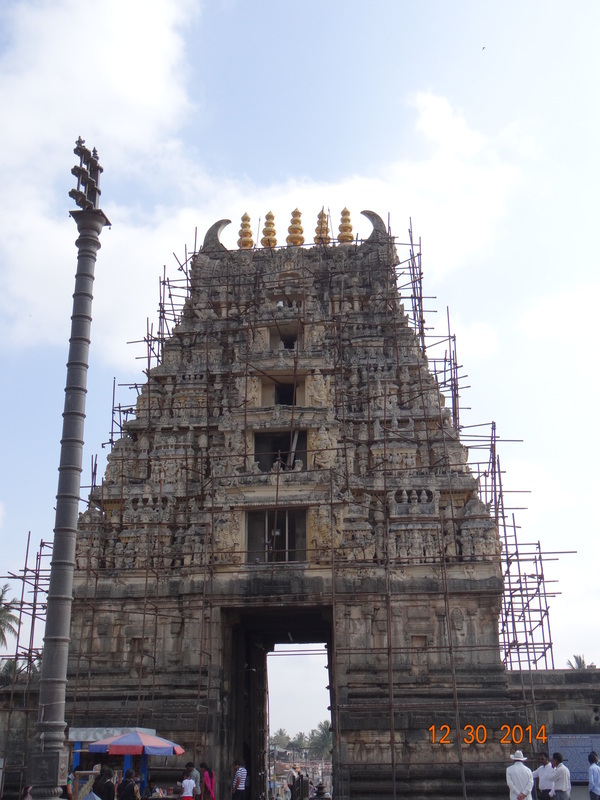 The tour guides are Government appointed, hence come with fixed prices and speak English, Hindi, Kannada and Telugu. 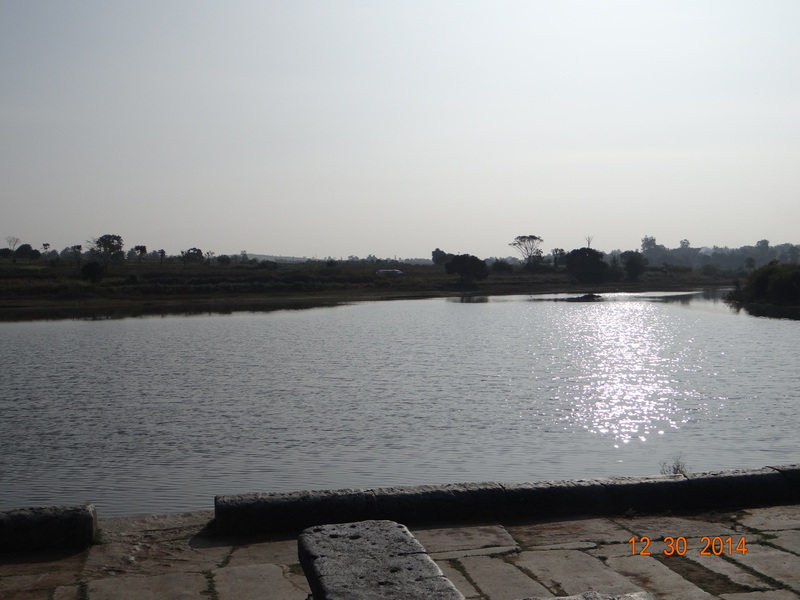 We spent INR 250 each at both places for the tour guide, but I think it is worth it considering how much information and history of the place you get to know from them. 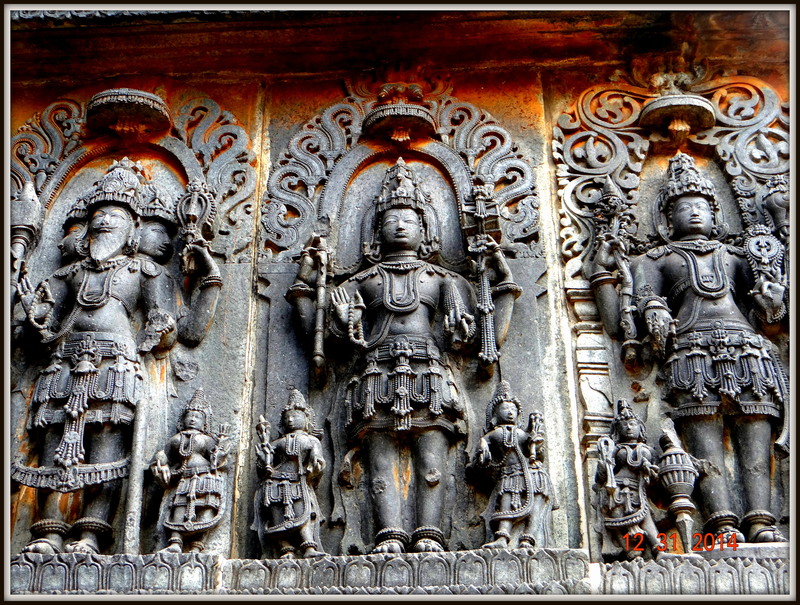 The Belur and Halebidu temples are the architectural marvels of the Hoyasala dynasty built by three generations of sculptors and architects, the most important of them being Jakkana Acharya. 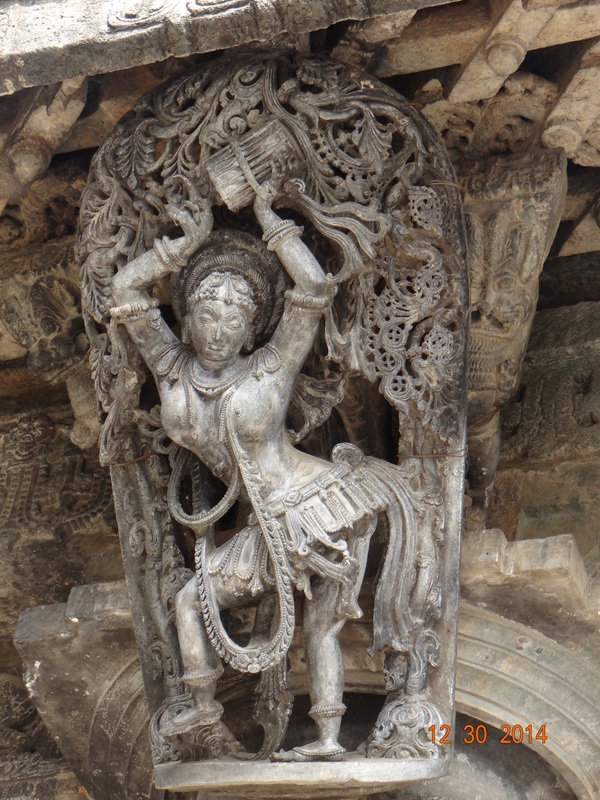 All the temples of Belur and Halebidu have a good mix of culture, art and religion; ranging from sculptures, depicting stories from from the Hindu mythology, to beautiful dancers and some imaginary, yet brilliant creations of the artisans. 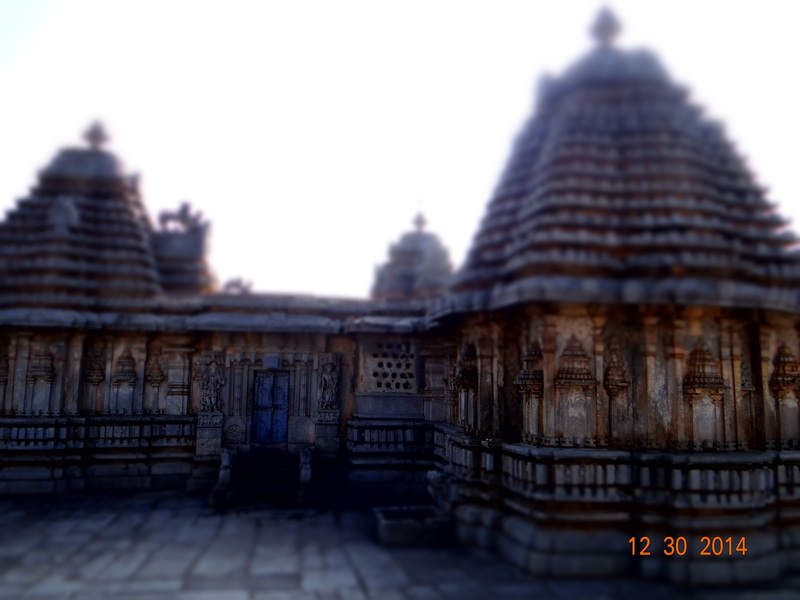 All the temples here are built with soap stone. You will be surprised at how scientifically and aesthetically perfect, some of the finer details have been thought through. 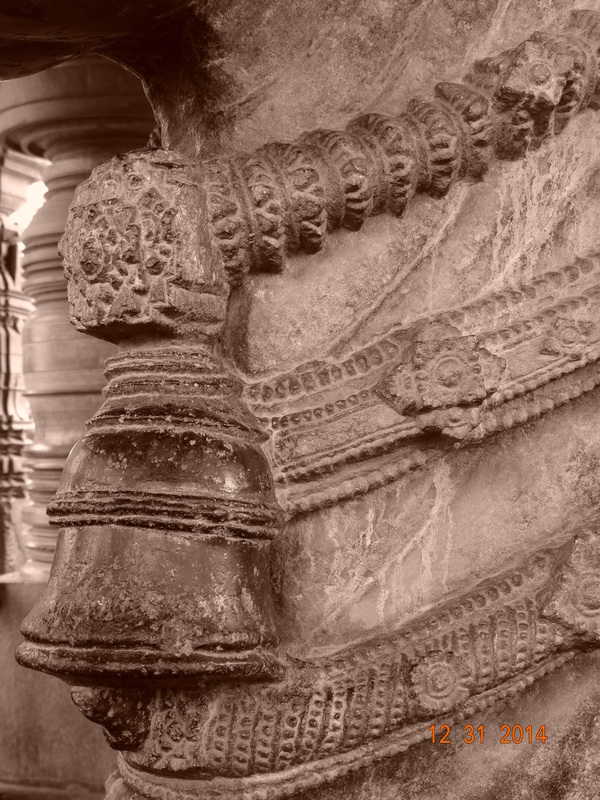 In both the temples you would find ruins from the conquest by Alauddin khilji and Malik Khafur from the Slave dynasty. Here a very few pictures from our trip. 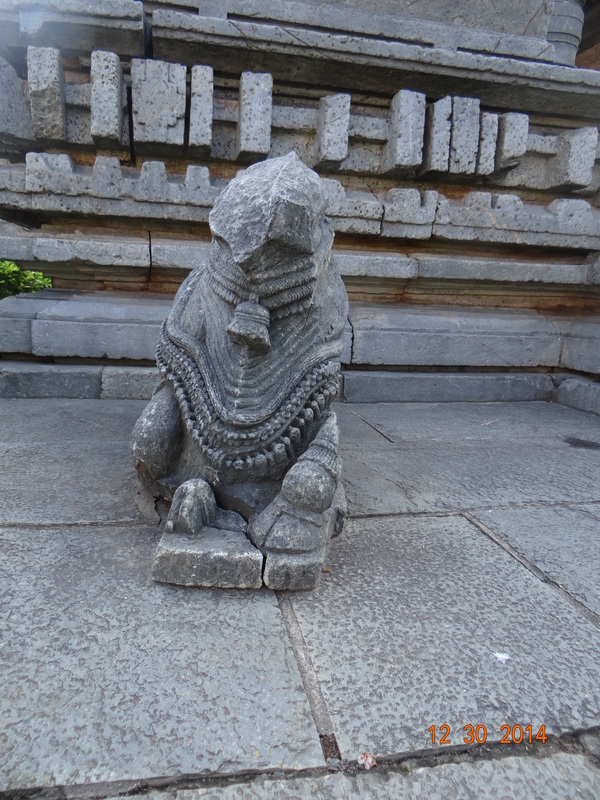 Lakshmi Devi temple, Doddagaddavalli: We first visited the standing Lakshmi temple, one of the oldest temples of this dynasty. This does not attract as many tourists as its other two famous cousins, but is equally beautiful and is on the banks of a river which makes the scene even more beautiful. 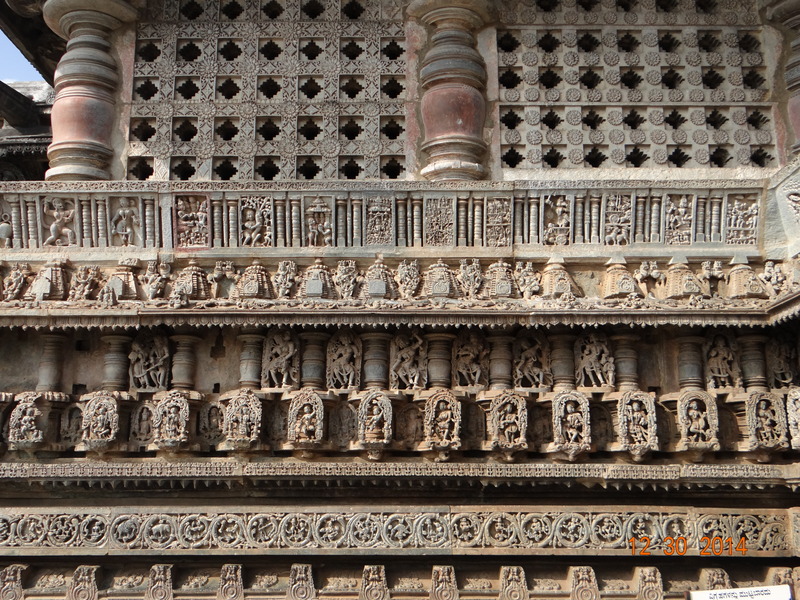 It has all the marks of the Hoysala architecture. 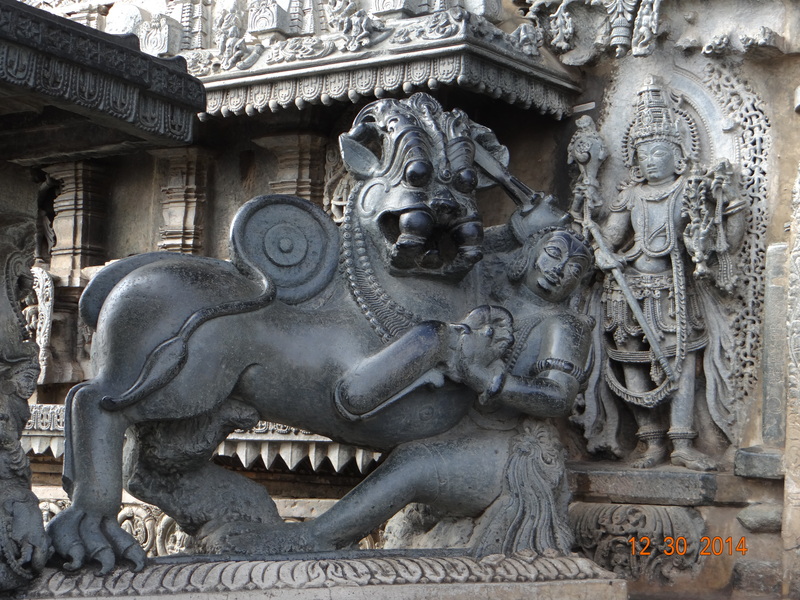 Belur: After that, we continued our journey to the famous Chennakeshava Temple of Belur, one of the architectural marvels of the Hoysala dynasty (12th and 13th centuries). 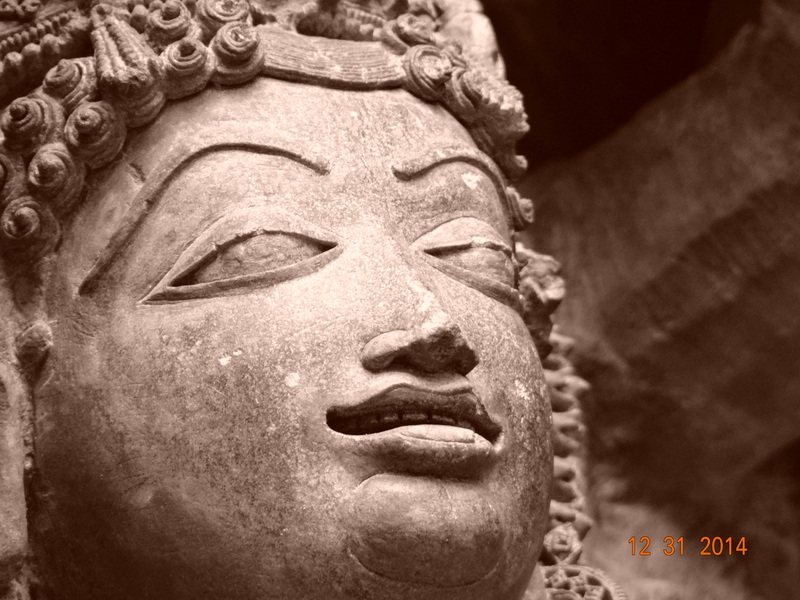 It is evident that the temples built during the reign of Hoyasalas are not only built for religious purposes but also to educate the people about their art, society and mythology. 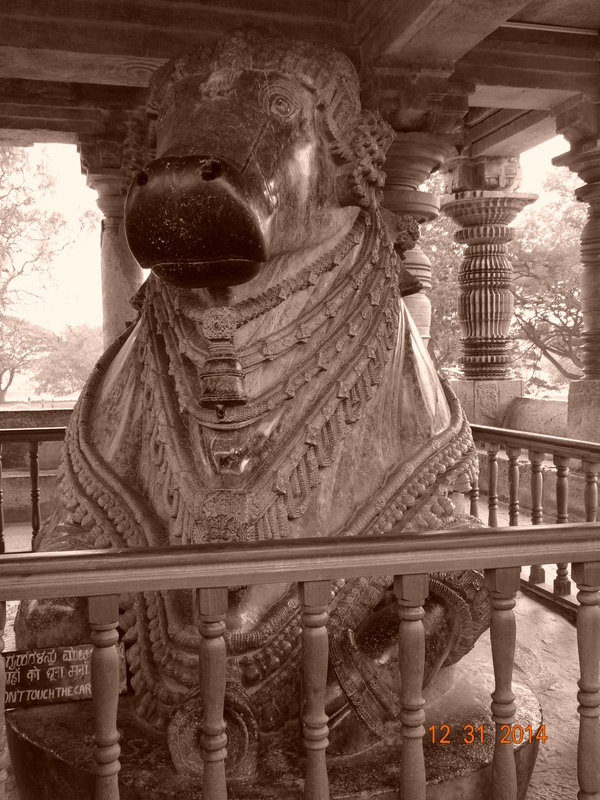 This temple took almost 103 years to build. 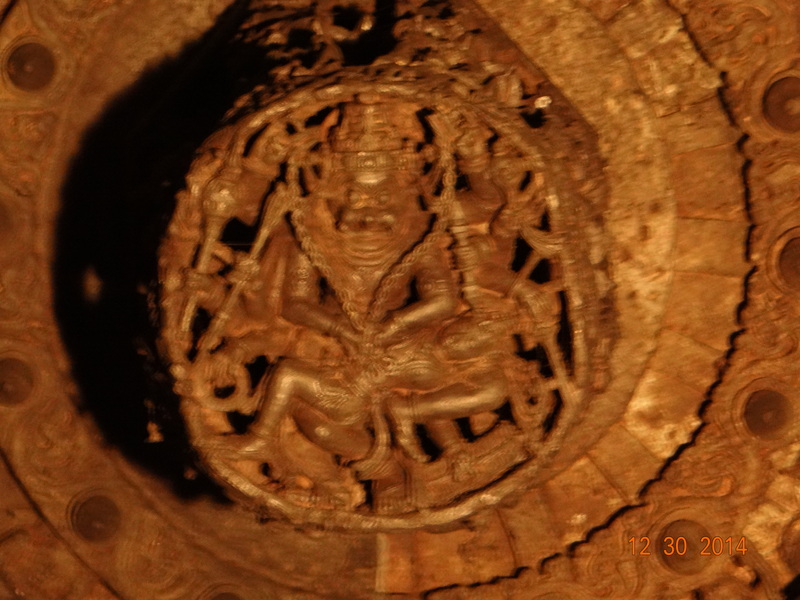 This beautiful statute of the Narasimha Avatar was on the ceiling! 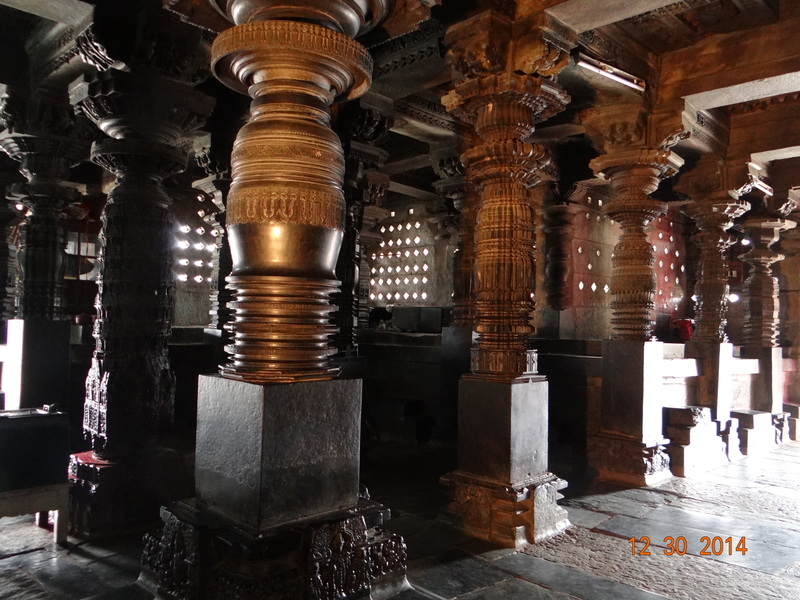 The pillar beauty.. Each pillar has a different architectural design! 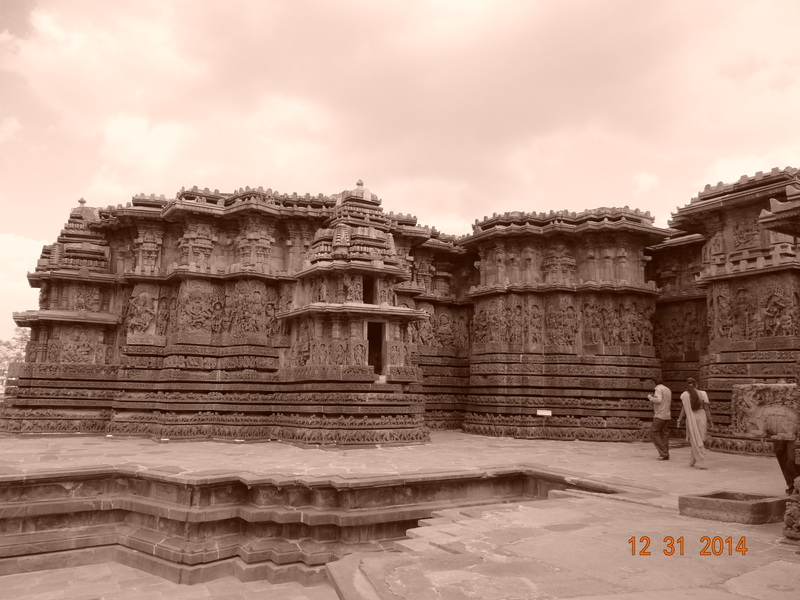 Halebidu – The hometown of Hoyasaleswara and Shantala devi temple. 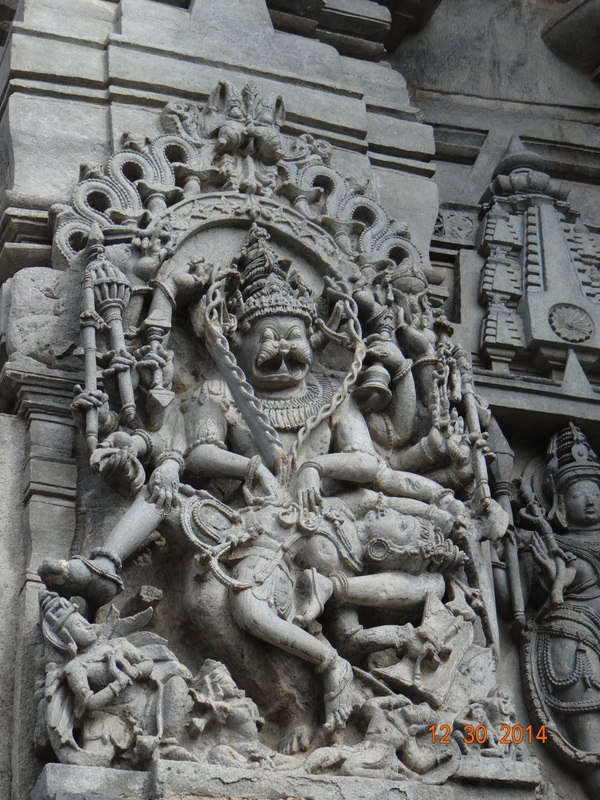 It was believed that the temple was commissioned by the prime minister to pay his due respects to the king Vishnuvardhana Hoysala and the queen, Shantala. 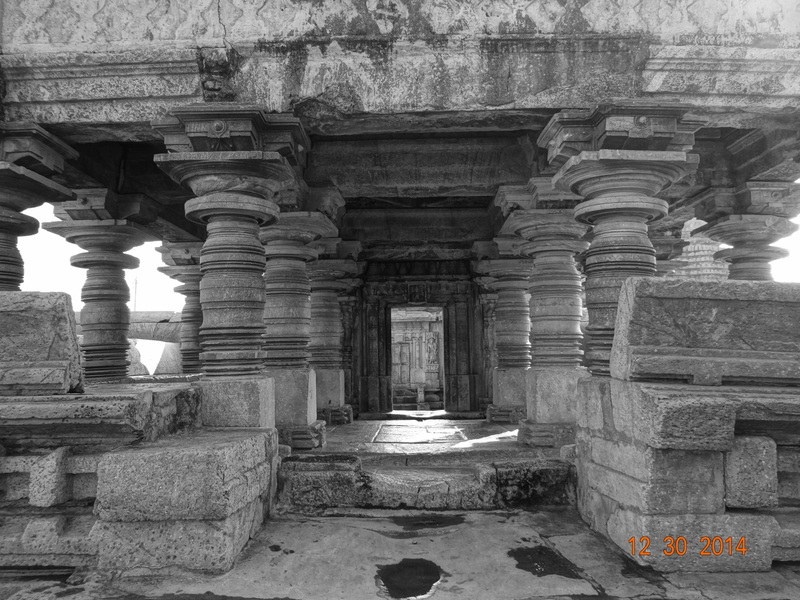 Also another scientific wonder of this temple is the pillar at the entrance of the temple which has been literally planted without the support of any foundation, which is further proof of how advanced our architects were in those days. You should try this experiment or at least ask the guide to demonstrate where he slides a piece of paper under one of the sides of the pillar and it comes out of other. 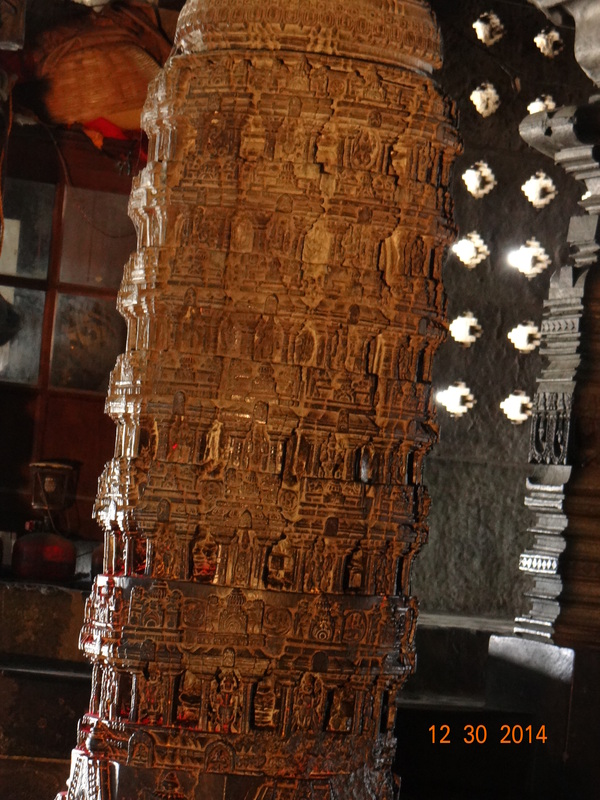 This goes to prove that this pillar is standing without the help of a solid base. 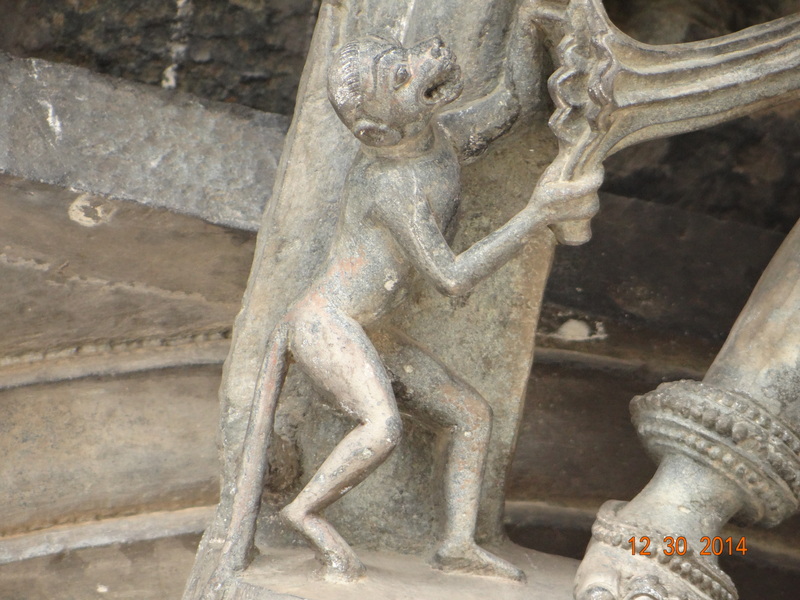 Do you see the teeth of the monkey? 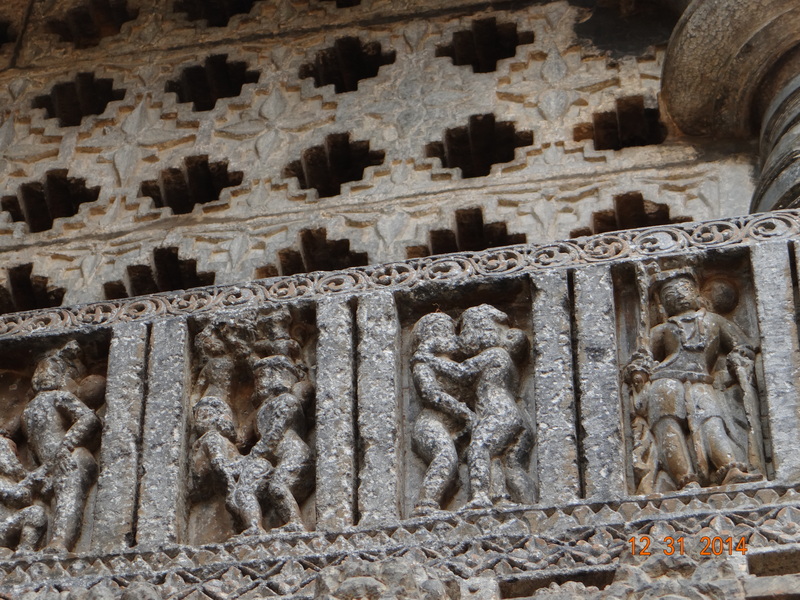 And this is made of stone! Do you see the folds on the neck? 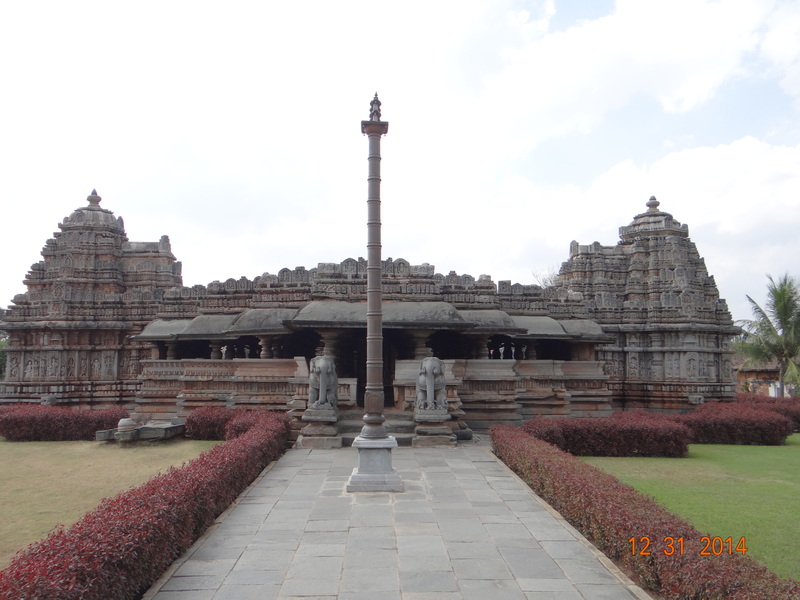 Jain Temple: There is a Jain temple, about 5 km from Halebidu. 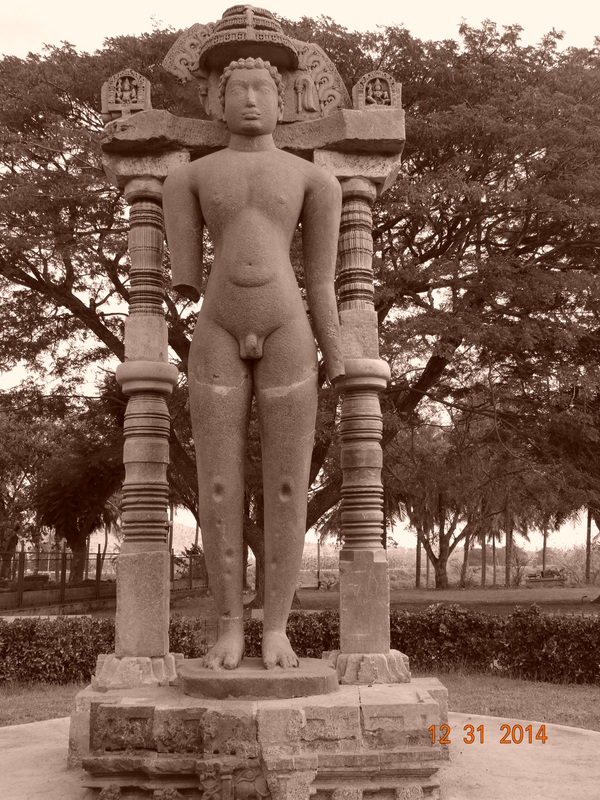 It is said the King Vishnuvardhan, was a Jain himself built this temple before you converted to a Hindu to marry Shantaladevi. As a last stop, we went to the Belavadi temple, which almost looked like a replica of the other temples. Thus comes the end of our first journey together this new year!